Walk into any design classroom, at any college in America, and you’ll see a comfortable mix of male and female students. Turn your attention to the front of the classroom, or down the hall to the faculty and staff offices, and that wonderful gender balance starts to skew. Travel outside the campus, and there’s really no balance at all. But why? If there are design classrooms across the country with a 50⁄50 blend of men and women — and in many classrooms, there are more females than males — then why doesn’t the design field represent the same ratio? Why does creative employment still showcase a male-dominated presence? What happens to these passionate and educated females? Certainly, there must be more to it than child-bearing — or is there? Is a more gender-balanced field really all that important? Why, or why not? These questions and many others accompanied me to a design and technology conference this past fall. Minnebar, an annual Twin Cities conference that celebrates vision, niche technology and collective wisdom, provided the perfect platform for such inquiries. I hosted a session aptly named “The Equal Sign” to pitch the dilemma of the field not representing the classroom. I played the role of discussion facilitator, and was eager to see where the conversation would go. What I hadn’t realized, was that I wasn’t the only one perplexed by this phenomenon. According to Findings From A List Apart Survey 2009, a poll created by and for Web designers, 82.6% of Web designers are male. Ironically, 66.5% of the same respondents stated there is “definitely not” a gender bias in the design field. Web design is just one segment of the design world, but the statistic is nonetheless chilling. My audience for the session? Predominantly female. It seems the topic itself is more intriguing for women than men. What these women had to say was sobering. One mentioned that it’s foolish to expect a male-dominated field to be able to design interfaces that appeal to how women want to interact with technology. In other words, young girls put off as consumers of technology aren’t likely to desire to create in that arena. Another common theme during the discussion was that of heroes. So few female designers exist, and of them, few are known superstars in the industry. Of these, even less are known by individuals outside of the industry. Lack of visible female heroes results in lack of female interest. But there are countless male role models in the field; why can’t they be heroes for young girls with computers? The same reason why I’d rather aspire to be Run DMC, than Mariah Carey. In the book Unlocking the Clubhouse: Women in Computing, two researchers at Carnegie Mellon University found that “research shows that both males and females believe that males are better than females at computing” (Clarke, 1992; Spertus, 1991). This finding is nearly 20 years old, but this mindset could easily have been held by the parents of today’s college students. Going to college can be hard, but pursuing a degree with little support from mom and dad makes it even harder. 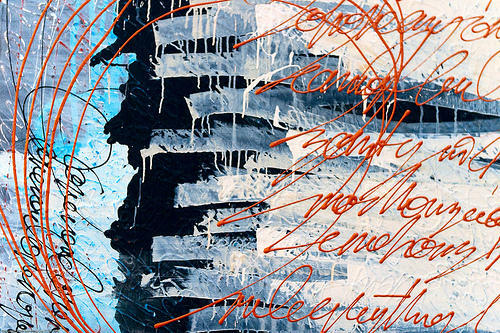 There is also an unspoken expectation that women are very creative and make great print designers, but aren’t wired to splice the intricacies of new and constantly changing software and platforms — as noted in a Fadtastic.net article written by designer Matt Davies. The field generally represents the occurrence of women holding positions in print, illustration and photography, with noticeable scarcity in more technology-dependent roles such as Web design, animation, game design and programming. 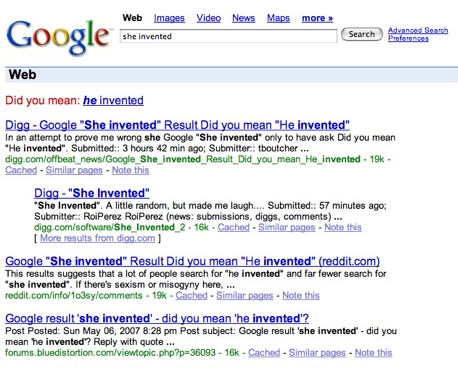 Google used to return the correction “Did You Mean: He Invented” for the search “she invented”. It generated a lot of buzz throughout the Web. Conditioning is perhaps the most obvious and potentially controversial (but definitely the most changing) of all the reasons why there aren’t more women designers. Video games and scrapbooks are cliché, but a telling, cultural phenomena. Traditionally, young boys have been fascinated with video games. The constant newness of the technological capacities; the integration with other male stigmas, such as television and computers; and certainly the intense competitive nature of the games, whether against a friend or the software itself, have all catered to masculine characteristics. Scrapbooking, on the other hand — often a self-involved, self-rewarding, aesthetic, process-oriented affair — has appealed to feminine sensibilities. Great; but what do video games and scrapbooking have to do with gender gaps in creative fields? Everything. And, it’s changing. In the Newsweek article “’Where’s My Crazy Hot Guy?’ A Female Designer On Women and Videogames,” award-winning female game designer Brenda Brathwaite confessed, “There was a time literally, within this decade, when I knew every single female game designer out there. Personally….” Video games, or more specifically, the video game format, have found their way into almost every media component of our lives. Log in to Facebook, and in no time you’ll end up fielding requests from friends to play “Farmville.” Shop your favorite store online, and you may be prompted to click a link and dress a sophisticated cartoon character to help you with your purchasing decisions. Save some time at the grocery store by going through the self-checkout line, and you’re confronted with the all too familiar series of buttons, colors and graphics to ease your way through the credit card swipe and out the door. Video gaming isn’t just something engaged in by teenage football players. It’s a format that is relevant to men and women, boys and girls, and this inclusion of the female population is invariably causing more females to ask themselves how it all works, and how they can be a contributing factor. All things design — video games, Web design and graphic arts — can bring two genders together and create acceptance and encouragement, which fosters the potential to level the creative employment playing field. You must ask yourself, “Is this a good thing?” There are numerous reasons why more women are needed, and need representation; but is the “female designer dilemma” really all that bad? If a city of people stormed the doors of their school district demanding more male kindergarten teachers, they might be mercilessly scoffed at. Similarly, few are tooting the horn for more female firefighters, or male nurses. Our culture has built functioning gender-based roles, and has birthed young boys and girls excited to fill them. Why fix it if it ain’t broke? If gender balance is achieved in the creative industry, will it be adding new jobs for females, or replacing jobs that males had? If the latter is the case, what will happen to these men? My audience at Minnebar had blank faces, and empty responses, when I asked them. Fisher, A. and Margolis, J. (2002). Unlocking the Clubhouse: Women in Computing. Cambridge, MA. MIT Press. This post is an article from our series of “opinion columns,” in which we give people in the Web design community a platform to raise their voices and present their opinion on something they feel strongly about to the community. Please note that the content in this series is not in any way influenced by the Smashing Magazine’s Editorial team. If you want to publish your article in this series, please send us your thoughts and we’ll get back to you.